One of the easiest ways to manage your content restrictions in Restrict Content Pro is to use the category restrictions feature. This lets you control the visibility of content for groups of posts without the hassle of editing every post on your site and defining the restrictions individually. Let's take a look at how it works. 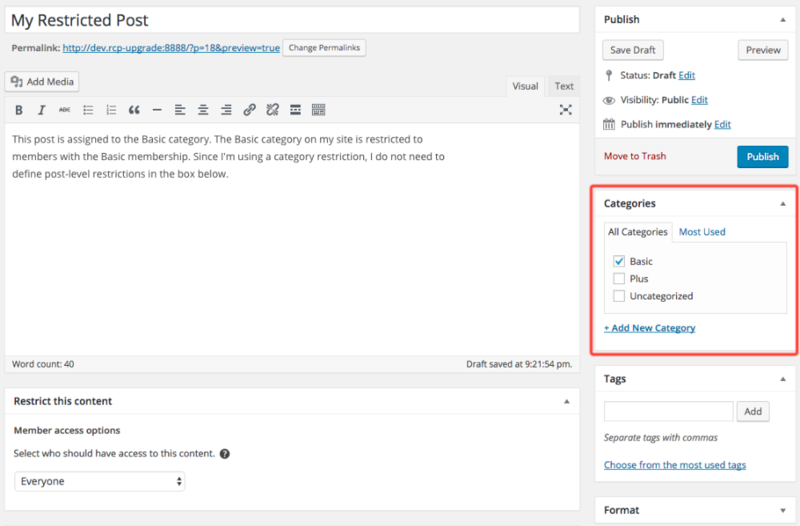 To set up category restrictions, go to Posts > Categories in your WordPress dashboard. Edit the category you want to define restrictions for, and configure the restriction settings. On the Edit Category page, you will see the access control options at the bottom. See the screenshot below for reference. Paid Only? - Restricts the content to members that have paid subscriptions. Members with free subscriptions will not be able to see the content. Access Level - Restricts the content to members who have the defined access level or higher. For more information about how access levels work, see this help file. Subscription Levels - Restricts the content to members who have one of the selected subscriptions. The member must have an active subscription. Now that you've defined your access control settings for the category, you can assign your posts to the category, if they aren't already. And that's all there is to it! 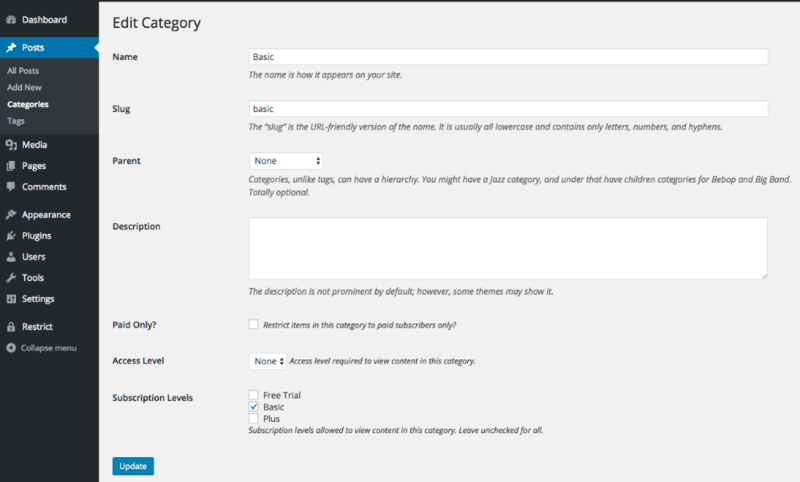 Using category restrictions is an easy way to manage your content restriction settings in bulk. Does it work with tags and other custom taxonomies? Yes! The content restriction settings are also available for tags (under Posts > Tags) and any public custom taxonomies registered on your site.